Difference between revisions of "Geometric symbols"
The pentagram symbolzes the human anatomy and form. it corresponds to the strength of the human soul over the four elements. It also symbolizes the human hand. It also corresponds to the four elements plus the fifth, the Akasha, or spirit, considered to be a principle and the origin of all elements, and therefore all existence. The pentagram symbolizes the human anatomy and form. it corresponds to the strength of the human soul over the four elements. It also symbolizes the human hand. It also corresponds to the four elements plus the fifth, the Akasha, or spirit, considered to be a principle and the origin of all elements, and therefore all existence. This page provides an elementary explanation of geometric symbols and their use in general magic. Most geometric symbols have the same occult virtues as their numerical equivalent (the octogram has eight sides, symbolizing the number 8). The Triangle has the occult virtue of limitation. 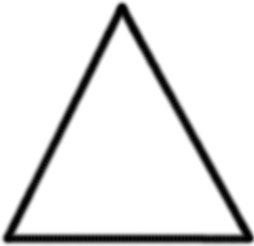 Therefore, the use should be clear when it comes to evocation, as the triangle can be used to bind spirits within a controlled environment. The limiting qualities, when brought out by the will of the magician, are able to limit and bind. The square, being principally associated with the planet Jupiter, shares the occult virtues with it. The square symbolizes a walled structure, or a castle. This explains the association with rulership, majesty, society, and other such Jupiterean qualities. The square also symbolizes the four elements working in harmony, and tetrapolarity in general. The Hexegram symbolizes equilibrium; it possesses the sublime occult virtue of balance. The two triangles balance each other out and reveal the universal law of duality: All things that enter into existence must do so with their opposite. The trained magician may quickly see how a talisman made for healing into the shape of a Hexagram will produce more effective results. The Septagram symbolizes nature and the number 7. A close examination of nature shows that the number 7 appears many times in many different ways. As one example, the ancient planetary order contained 7 planets including the Sun. The mystical quality of the number 7 appearing in nature is principally what creates the "luckiness" often experienced with this number. The number 7 also symbolizes divinity, though it is not as perfect as the purity of the number 8. A talisman constructed for luckiness with 7 sides would be conducive to the end result. The Octagram symbolizes systems, and also perfection in its greatest form (the number 8 ). The representation of all systems, knowledge, and mysteries is inherent in the octagram from the perfection of the number 8. Also, stability is a virtue of the octagram via the number 8. I would personally suggest more research, as there is much more occult benefit to knowing the numerology of the number 8. The number 9 is associated with emotions, the 9 muses of ancient Greece being a prime example. The enneagram is also connected to the moon, and so can be practically used for rituals or spells related to the Moon. it should be noted that undeer the right circumstances, the moon can be quite a supplement to magical ability and result, especially at certian lunar cycles. Meditation on the enneagram with the intent of findong the occult virtue will allow you to know more regarding when and how to use it. This page was last modified on 8 March 2008, at 22:06.